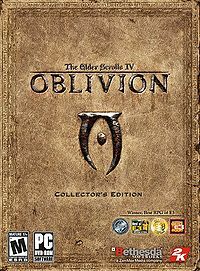 The Elder Scrolls IV: Oblivion, the fourth game in the Elder Scrolls series, is set within the province of Cyrodiil, the heartland and Imperial capital of Tamriel. Emperor Uriel Septim VII is assassinated in flight from his own palace, but just before he dies he passes on to you—the foreordained of his dreams—the mystic Amulet of Kings. The adventure proper begins with the quest to find Uriel's lost and illegitimate son—the only heir to the throne. 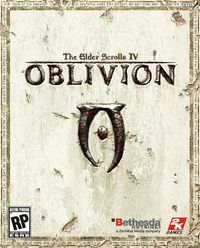 In a world where the forces of darkness seek their ultimate dominion over the ranks of man and mer alike, you alone stand between the future of Tamriel and the gates of Oblivion. 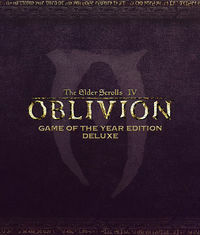 The Elder Scrolls IV: Oblivion Game of the Year Edition and Game of the Year Edition Deluxe are available to buy from Steam or GOG.com. 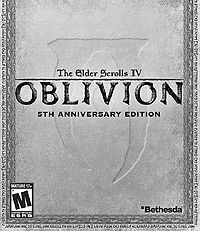 It is also available for Xbox 360 and PS3, and is backwards compatible on Xbox One. It is available to play on PS4 via the PlayStation Now cloud gaming service. 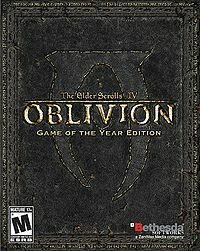 Note that most add-ons are unavailable on the PlayStation version. Additional general game information can be found here. Attributes — What are the basic stats? Birthsigns — What do the stars say about you? Infamy — ...or a notorious criminal. Skills — And what can you do? Maps — Are you familiar with your whereabouts? This page was last modified on 6 October 2018, at 05:32.